as to what they were known as 50 to 60 years ago. inside toilets and years later they built Rollins Villas with outside toilets STRANGE!!! it was simply known as The Ballybrack Rd or The Bray Rd. I'm locking this Topic and merging it because there's another Topic on the same. No worries though, you will still get notifications of responses to it. EDIT: This new Topic was moved folks. There you go Jabra. I'm sure you'll get plently of responses now. Cheers. Did any of you know John Ebble "Ebbler" and either or both of them Anthony Fitzpatrick "Dinah"
Dinah was a Roadie with Bagatelle. I have heard rumours that both of them have passed away, but some people are maybe not so sure of that. If anybody knows anything can you let me know thanks folks. 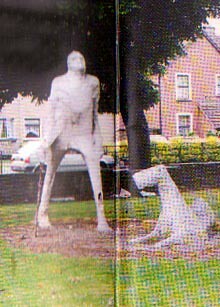 Does anyone remember the plaster sculpture in the park beside the noggin inn of the man and dog. Awful lookin' thing....does anyone know when it was put there, or anything about it? Yeah Ger, it was called "Dark Man" by Paddy Glynn. 1986. Concrete and Steel. I liked it but the local Kids wrecked it. That's what you get when trying to introduce some culture into the Noggin. There you go Ger. I have it in an old leaflet. Do you remember there was a bit of "controversy" over it after it was demolished? As said below it was listed as Concrete and Steel and that should have stood up against even the Nogginers BUT what the Artist didn't say was that those materials were built around Fiberglass. In the photo you can see the knee was mashed to reveal that it was hollow inside. I clearly remember the hole in it at the time. It didn't last long after that. Ok well let's not say controversy. It was chicken wire covered in Fibreglass and coated with cement on a steel stand. That's not exactly Concrete and Steel is it? Big difference. If the frame had been made of Steel into a concrete mould it would probably still be there. but you lot have really banjaxed it -----you now have the Sallynoggin you deserve -full stop and comma. I remember a big push by the Council to have sculptures throughout the Boro. Blackrock got the three skinny lads holding up the Black rock at the Back Road and a sculpture at the top of the Park...think there was one in Brookfield too...then the Ram on the Bray slip road..etc..
Rocker wrote: I remember a big push by the Council to have sculptures throughout the Boro. Blackrock got the three skinny lads holding up the Black rock at the Back Road and a sculpture at the top of the Park...think there was one in Brookfield too...then the Ram on the Bray slip road..etc..
grammer wrote: but you lot have really banjaxed it -----you now have the Sallynoggin you deserve -full stop and comma. What'er you on about Grammer? It's 20 years or so since that sculpture was demolished. Sallynoggin is a great place now. The Sallynoggin management forum has done amazing work right through the area in the past four years and continue to do so. I'm here four years and have experienced nothing but friendliness. It's so hard to sir anything up around here anymore. What I want to know is where is Johndle ?????? He had a big soup ladel for stirring.